MENOMINEE----The Escanaba Cubs are picking up a little momentum as they head into the post-season tournaments this week. Escanaba pounded Menominee, 16-3, Tuesday night at Spes Field to finish the season on a three-game winning streak. The boys had been off for two weeks because of a scheduling conflict, and after losing to Gladstone last Thursday, the Cubs swept a doubleheader from the Eastern U.P. Travelers on Saturday. Matt Jensen pitched a complete game and Alex DeHaan had the big two-run hit as the Cubs won the opener, 3-1. Escanaba won the nightcap, 5-2, as Bailey Lamb threw five strong innings and Ben Kleiman finished up with two innings. Well, Tuesday night, with the Upper Peninsula Zone Five Tournament less than 48 hours away, Manager Tom Ohman put Kyle Berres on the mound for the first time. And the 19-year-old responded, pitching four innings. Berres allowed only three hits, walked two batters, and struck out two. Andrew Kausak pitched the final inning. Berres got plenty of offensive support from his friends. David Falish and Alex DeHaan each drove in five runs, and Ben Kleiman drove in three runs. Escanaba closes the regular season with an 10-12 record. The Cubs will face Marquette at noon on Thursday in the Soo, and then they'll face Menominee again, this time at 5:30 at Rudyard High School. The top four teams from the eight team tournament will advance to next week's state tournament in Marquette, along with the host Blues. Pictured: Alex DeHaan batting during a game in Marquette earlier this season. 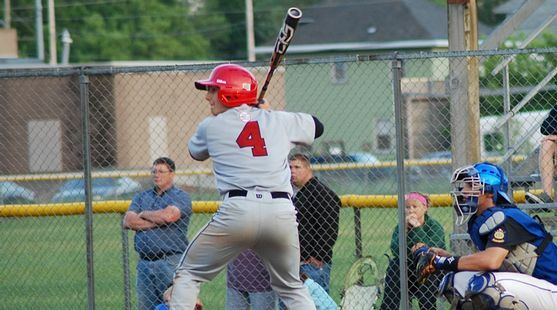 He had five RBI in Tuesday's game in Menominee. The Cubs play Marquette Thursday. NOTE----An additional game may be needed to determine the fourth U.P. team to make it to the state tournament. This would happen if Marquette is amongst the Final Four. This game would be played at 1:30 in Rudyard.